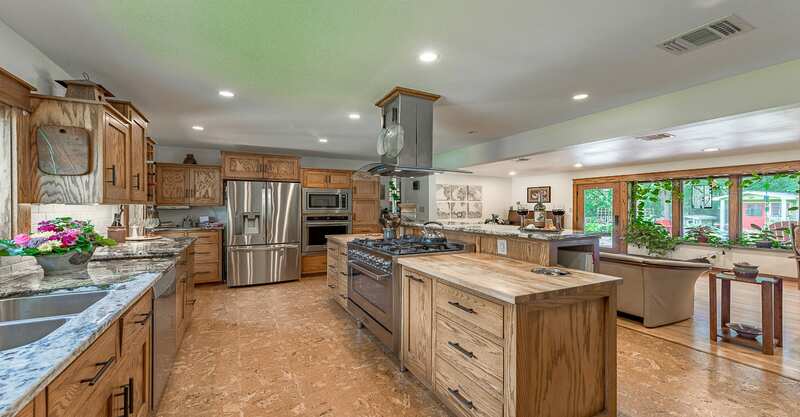 Some homeowners think that preparing for a kitchen remodel simply refers to securing the new appliances, counters, cabinets, flooring, wall covers, and other construction supplies for the new kitchen. However, remodeling the kitchen basically renders it inaccessible and unusable for the duration of the project. Ergo, there are steps you need to take to make sure you can still have meals without depending solely on takeout and eliminating potential risks to mitigate dangerous accidents. If you have an outdoor kitchen or patio, then you’re in luck. Setting up a temporary kitchen will be as easy as transferring a bulk of your appliances, utensils, and food items outside. If you don’t have one, you can create a temporary kitchen in the dining room, living room, or any spacious, adjacent area. If new appliances are part of your kitchen remodel, throw out all the old models except for your stove, microwave, and refrigerator for now. Alternatively, if you have portable stoves—such as an electric stove or a camping stove—and mini refrigerators, you can use those. What’s important is that you have a separate room with enough supplies to prepare meals for the next couple days (or weeks, depending on your timeline). Loose items refer to all the objects in your kitchen that aren’t bolted down. This means all your utensils, mugs and glasses, cooking and baking paraphernalia, food, decorations, and counter top appliances like microwaves, coffeemakers, blenders, and waffle irons. You’ll want to sort these into four major categories: food, appliances, everyday use, and pack away. The food and appliances categories are self-explanatory. The “everyday use” category refers to the plates, utensils, frying pans, cooking pots, spice bottles, drink pitchers, and other loose items that you literally use every day. These will automatically go to your temporary kitchen. 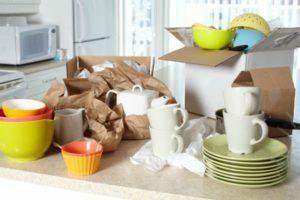 The “pack away” category refers to the same loose items mentioned above that you don’t use too often and can therefore afford to put away until the remodel is complete. For instance? Do you bake every day, or only on special occasions? If it’s the latter, you can toss those rolling pins and cookie cutters into the “pack away” box. When was the last time you used the giant wok you got for Christmas five years ago, or the asparagus cooker you received as a housewarming present? If you don’t use them on the regular, put them away. Canned goods, sauces, spices, cooking oils, and “dry” goods like chips, baking supplies, pastas, and pet food can be packed into boxes and stored in a dry area i.e. guest bedroom, living room, reading room, etc. Food items that need to be frozen or refrigerated, such as fish, milk, chicken, meats, and crisper vegetables and fruits will have to stay in the refrigerator. As we mentioned earlier, make sure to keep enough food items in your temporary kitchen to last you the length of your kitchen remodel. To lessen the stress of transferring frozen or chilled food, try to consume all your meats and vegetables well before the kitchen remodel starts and avoid buying more. Instead, stock up on dry food items like wheat bread, pastas, granola, and oatmeal. Read These 9 Ways to Save Money on a Kitchen Remodel! This step is so important. Before the remodel begins, disconnect the gas, plumbing, and electricity from your kitchen. Eliminate the risk of flooding or leaking during the remodel process by disconnecting the water and drain pipes from the sink, dishwasher, and refrigerator (if necessary) as well. The last thing you want to experience during your kitchen remodel is a gas leak or a power outage. Ergo, disconnecting the gas from the oven and cutting off the electricity to the whole room is definitely a non-negotiable.